I like the NCC-1701-J one best. But the one from the original series looks very good too, oddly enough. Now I’ve always been more of a star wars guy (in fact i’ve never even seen an episode or watched any of the ST movies), but I gotta say… the new movie looks AWESOME. Haha! you change a lot! get it while its still up!! 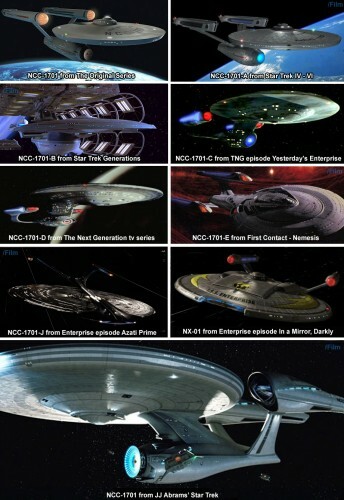 Not a big fan of star trek, only watched it a couple times in the past year or so, but these kinds of pictures I like. I don’t like Abrams Enterprise, and I saw the trailer at Quantum of Solace and thought it sucked balls. I refuse to see that piece of shite.